Save 15% with our new release sale! 2-CD set. Springsteen hadn't played a full acoustic set since the early '70s when he took the Shoreline Amphitheater stage for Neil Young's Bridge Benefit on October 13, 1986. 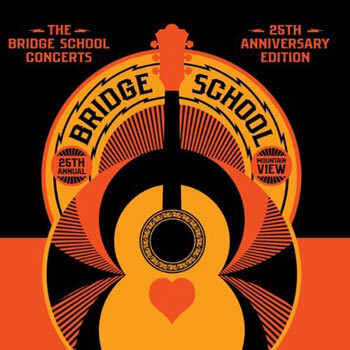 To celebrate that 25th anniversary, this release celebrates a quarter-century of Young's now-annual concerts supporting the Bridge School. With so many great nights to draw from, a compilation like this was bound to be a goldmine of performances, while not exactly a goldmine for Bruce or any other individual artist. So there's nothing here from Springsteen's return appearance in '95, which previewed the Joad tour. But the set kicks off with his stunning, unprecedented acoustic "Born in the U.S.A." from '86. Plus Nils Lofgren's "Cry a Little," and 23 other exclusive live perfomances from Young, Pearl Jam, R.E.M., Paul McCartney, Brian Wilson, The Who, and more, on two CDs.